Unlocked iPhone 4S: Great success! Thank you for your email, iPhones<sic> are locked and are not being unlocked. This is the heart-breaking response I received last week when I asked whether I can use a Telcel micro-SIM on my iPhone 4S when in Mexico. It’s now even more evident that Sprint does not yet have it’s <deleted> together when it comes to these kind of details regarding their iPhone 4S. I went to a Telcel store today. I patiently stood in line for half an hour. I gambled all of $150 pesos (about $11.50 USD in today’s rate) on a prepaid “Amigo” micro-SIM card. Popped it in and voilà! It works: I have my own local phone number. AT&T micro-SIM did not work. Telcel (Mexico) micro-SIM works like a charm. This agrees with other reports I’ve read online. I’d love to hear about your experiences, as YMMV. Glad to hear. I’m getting mine soon. Waiting to break the family plan with Luis first next week. if this is true and he bought it before 11/11/11 but it has 5.0.1….. will I still be able to use it when i travel to Mexico and use a prepaid Telcel sim card from Mexico??? 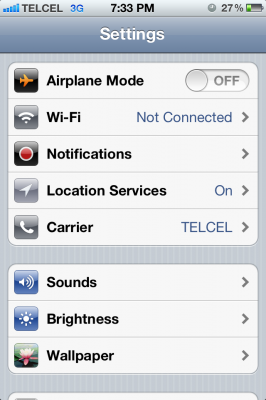 is it also true for BAD ESN iphone 4s….. Can a Bad ESN iphone 4s bought before 11/11/11 be use with a prepaid Telcel sim card from Mexico??? does it matter if its on 5.0.1 or 5.0??? Not sure what ESN means, but if the iPhone is a Sprint iPhone, then it will most likely work even with iOS 5.0.1. It works for me, that’s for sure. AT&T or Verizon will not work. Good esn means that its not stolen an you will be able to re-activate with sprint. Bad esn its the opossite! Did you ever tried to put a at&t sim or T-mobile? What was the result if you did? Did the carrier option stayed on? Do you know or do you think that it can be use with any pre-paid in the world? *Except USA!! I tried an AT&T SIM right after I got the phone and it did not work for me but YMMV. I have not tried T-Mobile. To me, it seems like it will work with any prepaid micro-SIM in the world except US T-Mobile and AT&T. I know for a fact that it will work in Telcel (Mexico) and Cellcom (Israel) and I read that Rogers (Canada) works.